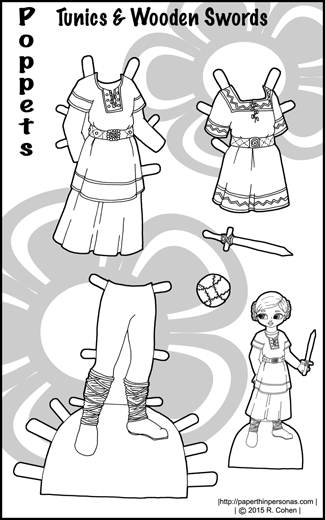 Clearly, I’ve been on a bit of a medieval kick with Monday’s 14th century set and today’s psuedo-medieval Poppet paper doll set. Ironically, I’m not that much of a medieval fantasy fan. As far as book genres, I’m much more into urban fantasy than anything in the classic or epic fantasy genres. Of course, urban fantasy generally doesn’t lend to crazy paper doll outfit sets. This set is partly because of my goal this year to make more Poppet paper doll sets. Last year, I only did eight Poppet sets which seems rather like a low number. This year my goal is at least ten. I also really want to do some historical clothing sets for them, since I have an absurd love of Victorian children’s clothing. Those sets, however, aren’t even drawn yet. I think I should finish some of my unfinished Poppet paper doll clothes before I start drawing more of them. I have a lot of unfinished Poppet sets lurking accusingly on my computer and demanding completion. 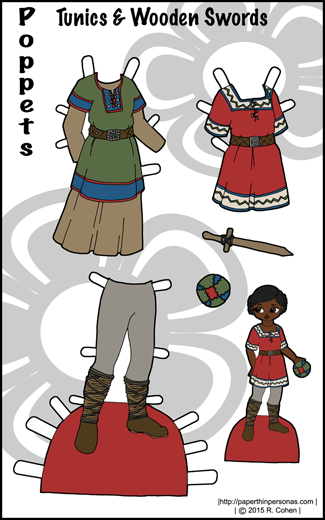 Today’s paper doll set features colors in the same family as my Marcus the Warrior paper doll. I almost gave them real swords, but that seemed like a terribly dangerous thing to give a small child, so a wooden sword would have to do. I really do enjoy drawing toys as accessories for the Poppets. Meanwhile, I have been giving a lot of thought to Copyright and other issues of posting content on the internet. Would people be interested on a post on that topic? I’d be interested in a post about copyright. Over the years, I have seen the issue pop up several times, mostly for comic artists who post their content on the internet (for free), so I’d definitely like to read your thoughts about it.